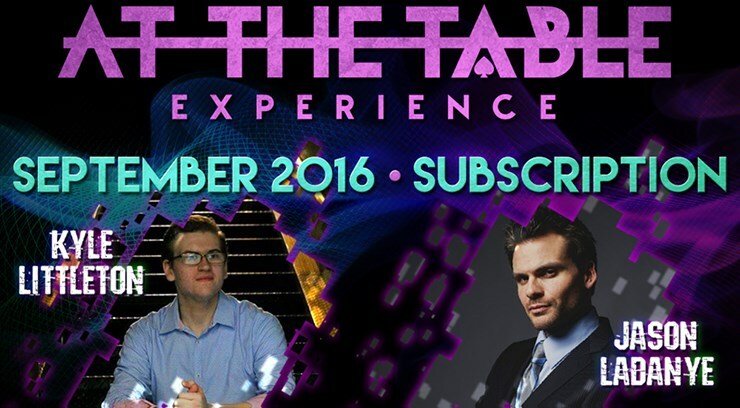 The September lineup goes full force with two very creative minds in magic. First up we're glad to welcome Vanishing Inc's own Kyle Littleton to an At the Table Experience. Best known for his effect 400 Lux, Kyle is one of the most refreshing innovators and thinkers to hit the scene. His lecture offers something for every skill level, and his presentations are filled with wit, humor, and honesty. Learn effects with cards, coins, stickers, gum, and bills. To add to the lineup, we give you Jason Ladanye. He will be teaching a few effects from his amazing book, Confident Deceptions. If you don't have it yet you'll want it after this lecture! But most of the material in this At the Table lecture will come from Jason's next book, Game Changer which will be released in 2017. All of the effects are super powerful ones that hit the audience hard, but are practical and meaningful as well. Jason teaches how to start clean and end clean with a regular deck of cards and perform card magic that people will remember forever. His approach to magic is simple. It's not about new complicated sleight of hand. Jason looks for original plots and uses time-tested well-known sleights to achieve miracles for laymen. In addition to teaching all of the mechanics to the effects, Jason talks shop about effect construction, audience management, misdirection, and how to maximize the impact of every trick. Each effect is a chance to tell the audience an entertaining story.